I had a great day listening to an audio book ("Fall On Your Knees" by Ann-Marie MacDonald) and finishing a cowl this afternoon. My 9 year old daughter has been my patient model as I master my iPhone photo-taking skills. I've been using white backdrops and figured out a combo of natural and a lamp to get crisp shots plus some online photo editing sites. I think I'm improving. I listed this item on my Etsy shop if you want to check it out. Feedback on my little shop is appreciated as I'm a fairly new online business owner. What did you get done today that makes you happy? 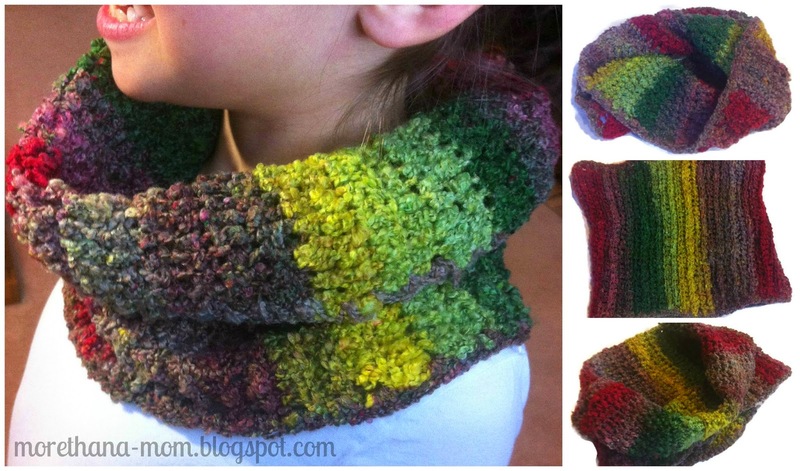 I used RedHeart's FREE Easy Tropical Cowl pattern.